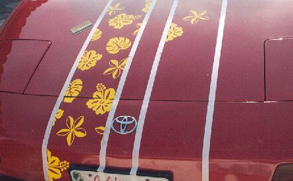 Auto Leis look great in a variety of applications. Here are some helpful tips. Apply your Auto Leis on a warm sunny day. Make sure your surface is clean and dry. 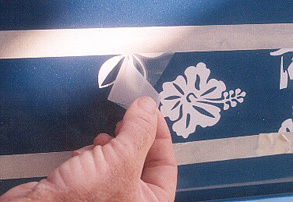 Separate the white backing paper by peeling it from the clear application paper. Using the clear app-paper, press down on your sticker in the desired location. Press down from one side to another to eliminate bubbles. Then peel back the application paper and you are done. 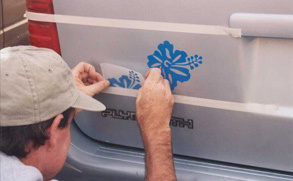 If you want to have the comp-stripe look instead of using the whole flower do the following. Use lines either already on your surface or ones you create by using masking tape to make your own stripe. Use the edges of your lines to guide your sticker placement. 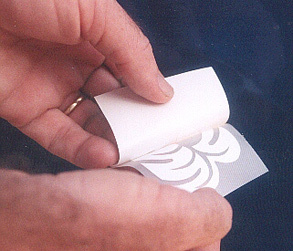 It is important to cut your stickers in a straight line then use each part of the sticker and place them alongside the edges of your tape or existing line. 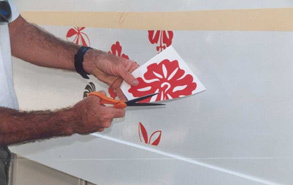 If your stripe is wide enough also use whole flowers occasionally as you work your way around. 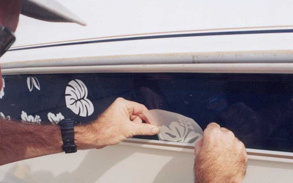 By cutting your flowers you can cover much more of your vehicle with Auto Leis. When done simply remove your masking tape to reveal your comp-stripe. Study the photos carefully to get ideas as to how you would like yours to come out. Mahalo!